Did the Columbia River Crossing highway/bridge megaproject for suburban Portland ever have a chance of becoming reality? A lot of folks who watched the project very carefully from the beginning doubt it. Part of the problem was that the $3 billion project became so bloated, so outlandish, that it simply collapsed under its own weight. Finally, about a month ago, the project was put out to pasture by Republican lawmakers in Washington. Scrap most of the highway enlargements that were part of the Columbia River Crossing. Build a new eight-lane highway bridge immediately upstream of the current Interstate Bridge. 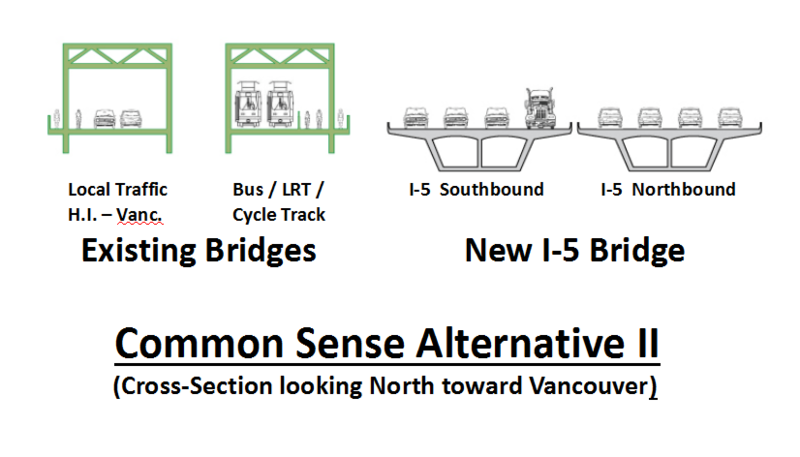 Repurpose the Interstate Bridge as a two-lane local street, a light rail crossing and a pair of dedicated cycle tracks. Interesting? You bet. Howell, the volunteer strategic planning director for the Association of Oregon Rail and Transit Advocates, says the whole thing would cost $1 billion, compared to the Columbia River Crossing plan’s $3.1 to $3.5 billion. Howell is one of a handful of amateur unpaid transportation wonks in Portland who are accustomed to preparing detailed plans that may not be likely to be built. But one of the things about Portland is that sometimes, crazy plans — MAX light rail, a modern streetcar, a citywide network for bicycle transportation — actually happen. And whatever the merits of this idea, Howell has a history of being on the right side of history. Maybe this is a concept that, unlike the CRC, will pass the test of time. Elsewhere on the Network today: CincyStreetcar Blog reports that $81 million in real estate investments along Phase 1 of the project route were announced yesterday. Strong Towns says that letting go of one cars means a household can pump an additional $7,000 per year into the local economy. And Human Transit‘s Jarrett Walker, writing for the San Francisco Chronicle, says a new generation is demanding different transportation solutions but it’s up to their parents to honor their wishes.